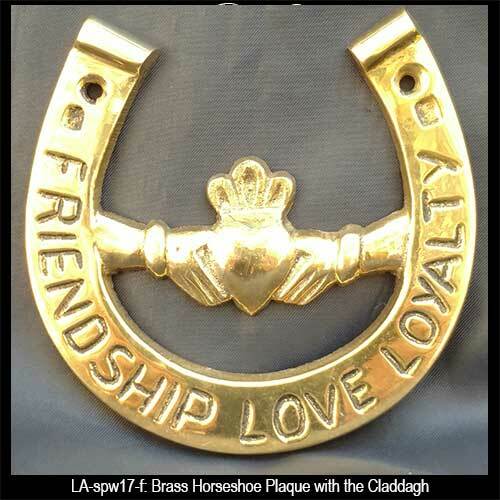 The Irish blessing on this horseshoe plaque is the sentiment of the Claddagh: friendship, loyalty, love. Keep this solid brass Irish horseshoe wall plaque pointed up so that the luck does not run out. The engraved Irish blessing on this horseshoe plaque is the significance of the Claddagh symbol. This Irish blessing plaque measures 3 3/4" x 3 3/4", and the mounting hardware is included. The Irish horseshoe is made in Ireland by Liffey Artefacts and it is gift boxed with a Claddagh history card that is complements of The Irish Gift House.